For my 32nd birthday my wife got me a session at my local university's Sports Medicine Assessment Research & Testing Lab, aka SMART Lab. My particular session included a Body Composition Analysis (i.e., body fat analysis) and a VO2 Max test. They also offer a 3D gait analysis, but that was not part of my trip today. I think my wife got me the Body Composition analysis to finally prove to me that I am too skinny. She pretty regularly tells me I could stand to gain a few pounds. I respond by eating excessive amounts of popcorn, but it doesn't seem to do the trick. Apparently all that training cancels out all that popcorn. I'm not really one for race reports, but this was kind of a special one for me. I've run the Jingle Dash, which is a local community 5k/10k (the latter of which is simply two laps of the 5k course). I set a PR two years ago when I broke 40 minutes and I came in second last year, which I considered to be an off year. I was excited to see how I would fare after last year's race. This year I planned on racing with Ellie in a stroller. I really wanted to win the race while pushing her, but wasn't confident I'd be able to do it. Really, I wanted to use her as an excuse if I didn't win. 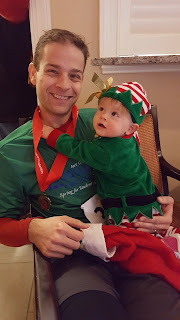 That excuse was taken from me at the start of the race as my wife decided she wanted to run with Ellie. Two of our friends were running and I knew it would be more fun for her if she had Ellie while running with them. Plus, it took away an possible excuse I might have.